As always, Orme uses words to paint the challenges woman (and men) face, in ways that lay bare the spirit and soul of who we are: beautiful creations made in the image and likeness of God Themselves – struggling to regain our identity. The notion of the perfected woman has terrorized society for time out of mind. 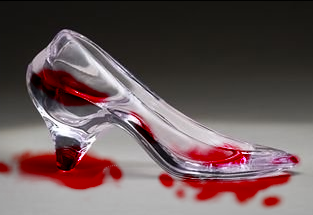 How many of us have tried to fit the glass slipper of perfection and then been heart sick to find it just won’t wear? Popular Culture thrives on the fragmentation of woman; it takes everyday girls and fractures their identity with the notion that they are not enough because they don’t look like the Barbie they grew up playing with. It tells them that they are either nice girls or naughty girls, girly girls or a tom boys, each label applied with a helping of judgment. Thanks as always Shawn, for loving and supporting my voice. Always. Not every author has a distinct voice – you do. I love its cadence, the symphonic movements of the words and how you use them to bring your thoughts and passions to life. Don’t let that go – it’s what makes you such a uniquely brilliant writer.